IQ Option is a well-established broker that facilitates the online trading of financial instruments like forex pairs, different types of options, cryptocurrencies, commodities, ETFs, indices, and stocks. These instruments can be conveniently traded on an award-winning trading platform with many useful tools and features. IQ Option started out with binary options in 2008 and has since grown rapidly to become a broker that processes roughly 2,000,000 trades per day! 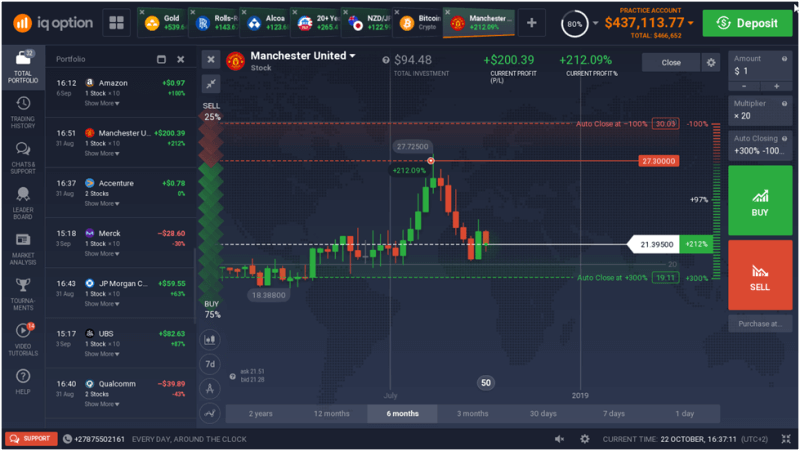 Here is our IQ Option review with all the information you need about what you can trade, different trading platform features, and how to get started! Trade forex, binary options, stocks, crypto, ETFs, etc. IQ Option Europe Ltd. is registered at Cyprus and is regulated by CySEC (the Cyprus Securities and Exchange Commission). IQ Option Ltd. is registered in St. Vincent and the Grenadines and this entity is not regulated. YOU CAN TRADE STOCKS, FOREX, COMMODITIES, OPTIONS, CRYPTO, ETFS, AND INDICES WITH IQ OPTION! IQ Option has different types of options you can trade. One of them is digital options. With digital options, the potential payout percentage is up to *900% and the trader can choose between different strike prices. *Payout percentages apply only to successful trades. The maximum payout percentage on digital options is 900%. A DIGITAL OPTION TRADE ON THE EUR/JPY CURRENCY PAIR. 19 standard digital options which are tradable during weekdays. 8 OTC (over the counter) digital options for weekend trading. Digital options can be traded with expiry times of either 1 minute or 5 minutes. However, trades can be entered late, which means that expiry times can be achieved of less than 1 minute or between 1 minute and 5 minutes. Digital options can be traded by non-EU traders and pro-EU traders but are not available to retail traders from the European Union. For more information about IQ Option’s digital options, please read 16 New Digital Options Available! IQ Option has been in the binary options business since 2008 and has received many awards for its excellent trading platform. IQ Option has about 60 binary option instruments to choose from. These are not only binary options on forex pairs, but also on different stocks, stock indices, and gold. IQ Option’s binary options can be traded with a wide range of intraday expiry times, as well as ‘end of the day’ and ‘end of the month’. The lowest expiry time is 1 minute. AN EXCEPTIONAL CASE WITH A 99% PAYOUT PERCENTAGE ON THE EUR/USD. IQ Option also has OTC (over the counter) binary options that can be traded over weekends for those traders who might be too busy to trade during the week. For complete information about how to trade binary options, please take a look at Trading Binary Options With IQ Option. Retail traders from the European Union are no longer able to trade binary options and digital options with IQ Option due to ESMA (the European Securities and Markets Authority) regulation. However, IQ Option has a great alternative for retail EU traders - FX options. For this group of traders, FX options are the only type of options they can trade with IQ Option. AN FX OPTIONS TRADE WITH LESS THAN 13 MINUTES TO EXPIRATION. IQ Option’s FX options offer uncapped profitability for successful trades. The potential profit is basically just limited by the magnitude of the price movement in the time available until the option expires. FX Options can be traded with the following expiry times: 10 minutes, 20 minutes, 30 minutes, 40 minutes, 50 minutes, and 60 minutes. However, because trades can be entered late, a trade’s actual expiry time may be less than the times mentioned above. For example, a 10-minute FX option contract can be entered more than 9 minutes late, which means that you can actually enter a trade which expires in less than 1 minute. Likewise, if you entered 5 minutes late on a 40-minute FX option contract, your actual expiry time would be 35 minutes from the moment you entered the trade. There are 6 different FX option instruments available. FX options are not available to non-EU traders but luckily they have access to binary options and digital options. For more information about IQ Option’s FX options, please take a look at How To Trade FX Options with IQ Option - Review and Walkthrough. IQ Option has about 174 stock CFDs which can be traded with leverage. Stocks are generally much more volatile than the forex market and traders who enjoy volatile markets are often drawn to the stock market. With stocks available on the same platform as IQ Option’s other instruments, traders can diversify their portfolios with great convenience, without having to open separate accounts for trading stocks. IQ Option’s stock CFDs can be traded from $20 per trade! For all the info you need about IQ Option’s stock CFDs, check out How to Trade Stock CFDs with IQ Option - Guide & Review. The forex market has some of the most liquid instruments you can possibly find. Spreads are usually very low compared to other markets and with a daily turnover of trillions of dollars, even large speculators and investors can get into and out of big trades relatively easily. IQ Option has a good selection of about 88 currency pairs to choose from. Currency trades, like all other CFDs by IQ Option, can be placed with preset stop loss and take profit orders. Pending orders are also available. 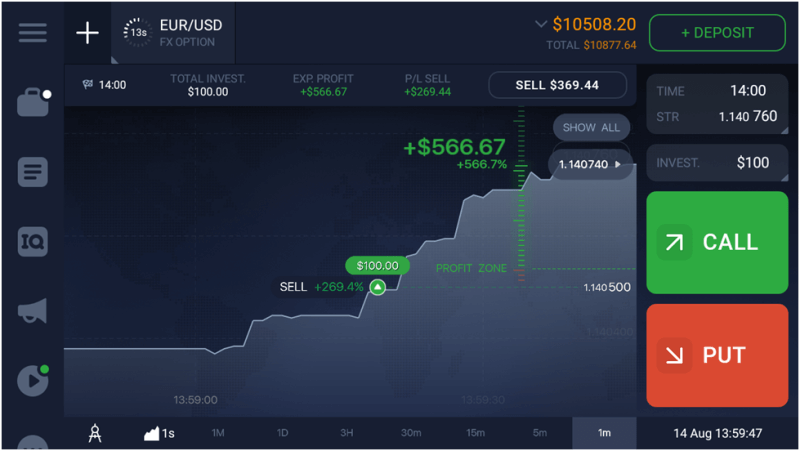 IQ Option has recently made some really positive changes to their forex leverage and traders can now trade certain currency pairs with leverage of up to 1:1000 (Retail traders from the EU are limited to leverage of up to 1:30). Examples are the EUR/USD, GBP/USD, GBP/CHF, GBP/JPY, and USD/CHF. For complete info about IQ Option’s forex instruments, take a look at How to Trade Forex with IQ Option - Guide & Review. With its exceptional volatility, the cryptocurrency market has attracted numerous investors and traders from around the world. 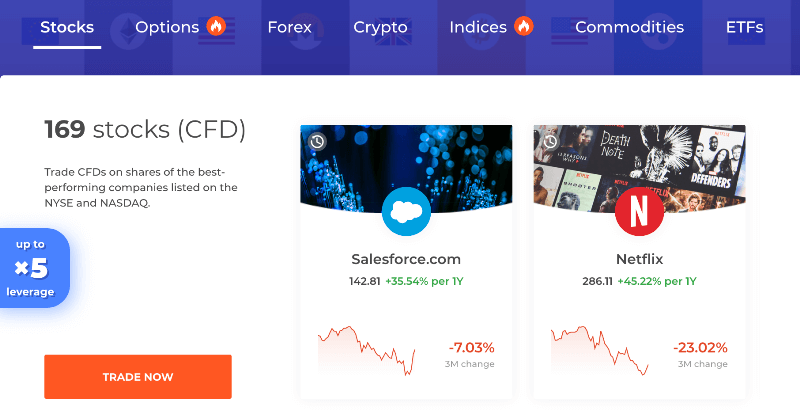 With cryptocurrency CFDs, traders can speculate on the bullish and bearish price movements of various cryptos without owning the actual underlying cryptocurrencies. So, whether the price is rising or falling, there is potential for profits to be made. 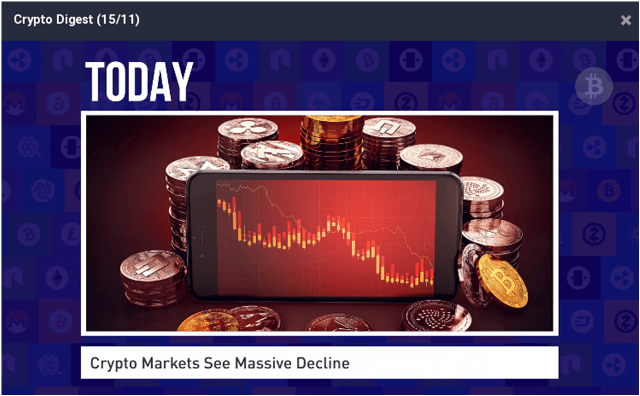 CRYPTO DIGEST IS IQ OPTION’S CRYPTO-DEDICATED NEWS CHANNEL. YOU CAN ACCESS IT DIRECTLY FROM YOUR TRADING PLATFORM! The standard crypto CFDs can be traded by clients from the European Union and those outside of the EU. Retail EU traders do not have access to leverage, while pro-EU traders and non-EU traders have up to 1:10 leverage. The special crypto CFDs have much higher leverage and much lower spreads than the standard crypto CFDs. These CFDs expire on a daily basis, however. Retail traders from the European Union do not have access to these instruments due to ESMA (European Securities and Markets Authority) regulation, while non-EU and pro-EU traders do. For more in-depth information, take a look at Trading Cryptocurrency CFDs With IQ Option. Commodity CFDs enable traders to speculate with different metals, crops, energies, etc, without physically taking delivery of it. For obvious reasons, this is a very convenient way to participate in the commodity market. Of course, a contract for difference allows traders to buy (go long) and short (go short) commodities, which means that gains can be made even when commodity prices turn south. HAVE YOU EVER SPECULATED WITH GOLD? 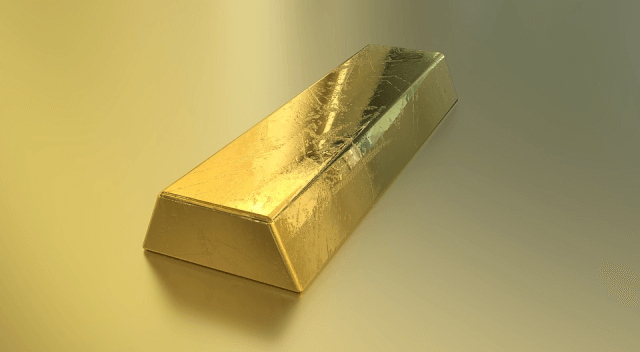 TRY IQ OPTION’S GOLD CFD! IQ Option has 6 different commodity CFDs available. As with all other CFD instruments on IQ Option’s trading platform, these CFDs can be traded from $20 per trade. The available leverage is up to 1:150 for non-EU and pro-EU traders. Retail EU traders are limited to leverage of 1:10. For complete information, take a look at How To Trade Commodities with IQ Option - Our detailed Review. LOOKING FOR BROADER DIVERSIFICATION? ETFS MAY BE YOUR ANSWER. Exchange-traded funds, or ETFs, are a very popular asset class; and for good reasons. ETFs enable traders to gain exposure to a market sector or a group of assets by simply trading one single ETF. This can make portfolio diversification much easier because traders do not need to select several individual instruments from specific sectors and combine them in their portfolio. Besides that, IQ Option’s ETFs have pretty low spreads and can be traded with leverage of 1:100 (by pro-EU traders and non-EU traders) and 1:5 by retail traders from the European Union. For more complete information, check out ETF Trading with IQ Option - Review and Guide. IQ Option clients can access its powerful trading platform in different ways, namely through desktop, web, and mobile versions. The mobile version is available for both Android and iOS devices. ON THE MOVE? IQ OPTION’S MOBILE APP HAS YOU COVERED! IQ Option’s trading platform has many useful features, charts, and trading tools. Let’s take a brief look at the things that make your trading as convenient as possible. Trade Directly From Your Charts - Whether you’re trading forex, options, or any other instrument, you can execute your trades directly on the charts you’re looking at. 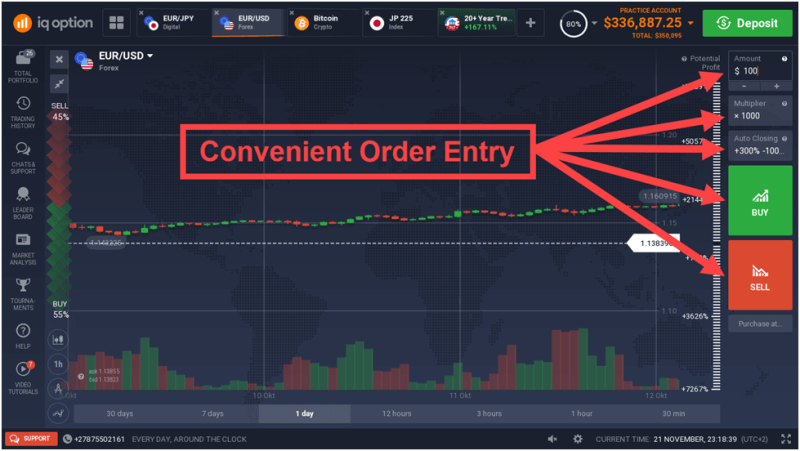 The order entry box is situated on the right side of the chart which means that pending orders and market orders can be placed while you keep an eye on the current price action. IQ OPTION’S ORDER ENTRY BOX DOES NOT OBSCURE YOUR VIEW OF YOUR CHARTS. Different Chart Types - Not only can you use line charts and candlestick charts, but also Heikin-Ashi and bar charts. Multiple Time Frames - Bar charts, candlestick charts, and Heikin-Ashi charts can be displayed in different time frames from 5 seconds up to 1 month. Graphical Tools - Some traders use trend lines, Fibonacci, and other lines in their trading. IQ Option has all of these available for you! Widgets - IQ Option’s widgets include ‘Other Traders’ Deals’, ‘Traders’ Mood’, ‘High and Low Values’, ‘News’, and ‘Volume’. SOME OF THE WIDGETS ON THE IQ OPTION TRADING PLATFORM. Technical Indicators - Whether you’re trading forex, options, stocks, or any other instrument, you have access to a good range of technical indicators that can be plotted on your charts. Some examples of technical indicators are moving averages, MACD, RSI, Bollinger bands, and stochastics. 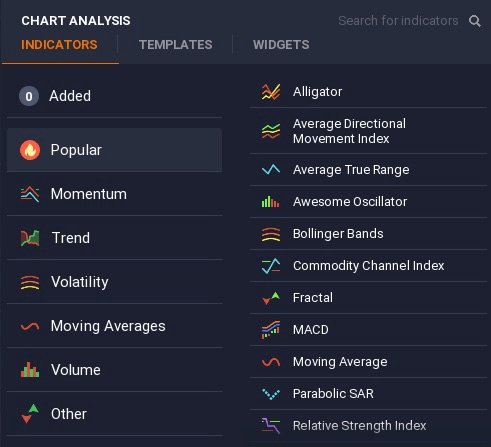 HERE ARE SOME OF THE TECHNICAL INDICATORS AVAILABLE ON IQ OPTION’S TRADING PLATFORM. Economic news, politics, and other news events often impact the financial markets in a meaningful way. IQ Option’s trading platform is equipped with a handy news feed to keep you on top of what’s happening in the world. IQ OPTION’S NEWS FEED AND DIFFERENT CALENDARS ARE VALUABLE FEATURES! IQ Option Trading Accounts - What are Your Options? IQ Option’s fully functional demo account has all the features and financial instruments of a real (live) trading account. With virtual funds of $10,000, traders can test trading strategies, acquaint themselves with the trading environment, or just have some fun. This virtual account balance can be topped up to the original value at any time, which means that you can practice your trading without any limitations. IQ Option’s trading platform was designed in such a way that traders can switch between their live and demo accounts with only three clicks. This is a really convenient and time-saving feature because both accounts can be accessed with one login. IQ Option’s real trading account offers you live trading with real money. With a little deposit of only $10, you can get real trading experience and partake in many different markets and asset classes. Whether you like forex, commodities, options, ETFs, stocks, cryptocurrencies, or stock indices, all of these are available to you. 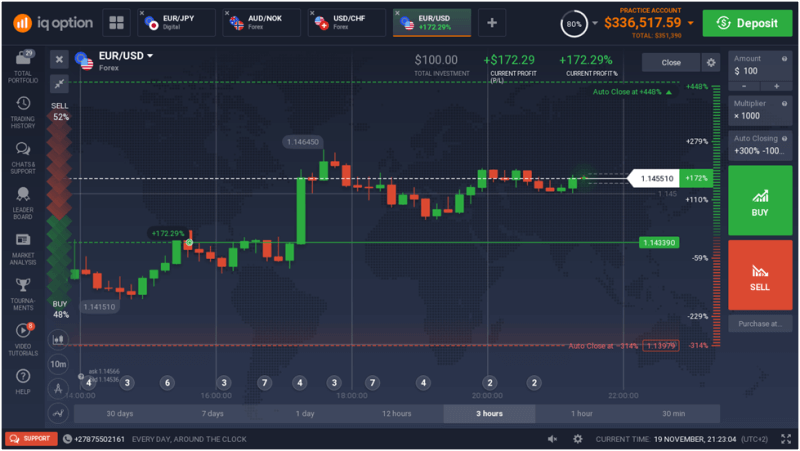 Besides normal trading, you can also partake in IQ Option’s trading tournaments which can be accessed directly via IQ Option’s trading platform. *Retail traders from the European Union do not have access to IQ Option’s trading tournaments. Pro-EU and non-EU traders can participate in these trading tournaments. To qualify for an IQ Option VIP trading account, you need to deposit $3,000 or more. A VIP trading account gives you access to quite a couple of perks, which include higher profitability rates and a personal account manager. VIP-Accounts are available for non-EU Citizens only. 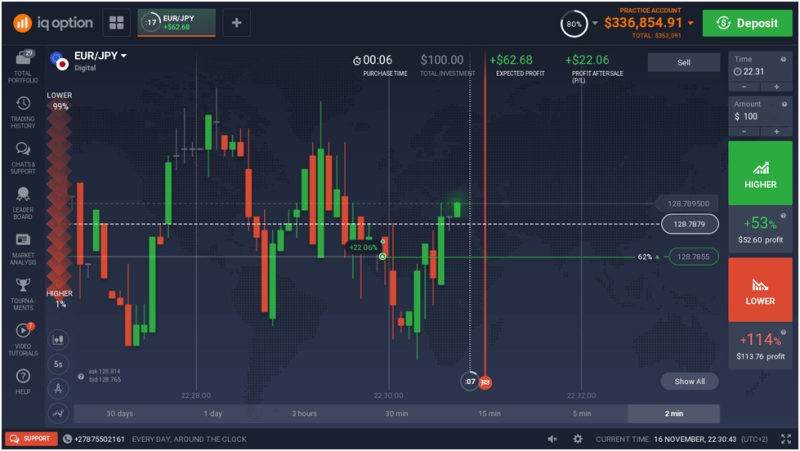 For more information about the advantages of a VIP trading account, take a look at IQ Option VIP Account Review - 6 Great Benefits. IQ Option clients can easily contact its support team via the ‘Chats and Support’ tab on the left side of the trading platform. At the bottom left of the platform, you will also see a telephone number that you can call 24/7. The chat feature is also available at any time of the day and week. Customer support is available in 13 languages! On the trading platform itself, traders can access video tutorials for free. 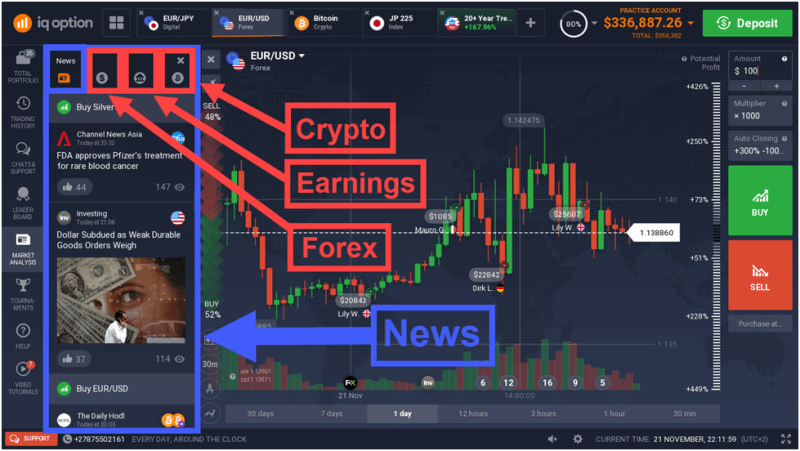 These videos cover different subjects, which include information on FX options, binary options, digital options, different chart patterns, how to use different technical indicators, CFD trading, and the Crypto Digest. With a deposit of only $10, clients can access a real money trading account with IQ Option and start trading certain instruments like binary options, forex pairs, stocks, and commodities with an investment amount of only $1 for options and $20 for Forex/CFDs. FX options require a minimum investment amount of 25 euro or $30. Who Cannot Use IQ Option’s Services? IQ Option’s services are available to all countries except to the USA, Canada, Australia, Belgium, Israel, Japan, Sudan, Syria, Turkey, and Iran. Some countries are excluded from using one, or both of IQ Option’s mobile apps. Users from Malta, Cyprus, and the Dominican Republic cannot trade with the iOS app, nor with the Android app. Users from Myanmar, Lichtenstein, and Cuba cannot trade with the Android app. Is IQ Option a Scam or Not? IQ Option is certainly not a scam. With more than 10 years of quality service to traders from around the world, IQ Option has received numerous awards for its trading platforms and other features. IQ Option processes close to 2 million trades per day and is a truly an innovative broker that is constantly seeking new ways to improve its services, trading platform, and variety of tradable instruments. IQ Option is a champion in the trading industry! IQ Option is a remarkable broker that keeps on evolving and improving despite being well-established already. An IQ Option demo account does not expire and with it, traders can enjoy all the features and tradable instruments of an IQ Option real account. All of IQ Option’s trading tools, technical indicators, and widgets are available to all users for free. Lastly, IQ Option’s customer support is really good and assistance is available to clients 24 hours a day, 7 days a week.